Pulsatilla alpina ssp. apiifolia (Ranunculaceae) (25x20,Z4,P,C,3:8w) ............................ 50 seeds / $4.00 19471.16 (W) Dolomites, 6400ft, 1951m, Italy. (= P. sulphurea.) Large yellow flowers on this beautiful "Pasque Flower." This colony grows on acid substrates in the Dolomites. 56434.29 (W) Kane Co., UT, 5700ft, 1738m. 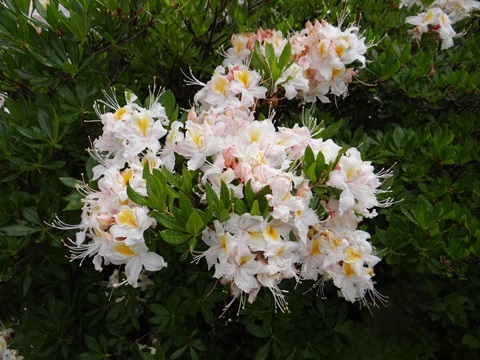 Woody shrubs with small, deeply-lobed leaves and abundant white, fragrant, rose-like flowers which transform into feathery plumes. 12641.11 (W) Amerillo, VII Reg., Chile, 3300ft, 1006m. Flesh-colored bracts and purple-black tubular flowers. Dasylirion-like rosettes of narrow, saw-tooth-edged leaves. Pyrola picta (Ericaceae) (20x12,Z5,P,L,3:8w) .............................................................. 100 seeds / $4.00 70555.13 (W) Kittitas Co., WA, 4300ft, 1311m. Thick, dark green, leathery leaves are attractively patterned with creamy veins. Racemes of creamy to pale-pink urns. Pyrrocoma uniflora (Asteraceae) (3x9,Z3,P,L,3:6w) ......................................................... 60 seeds / $4.00 85858.16 (W) Gunnison Co., CO, 12200ft, 3658m. Tight tufts of lanceolate leaves bear relatively large (3cm), solitary yellow flowers on short stems. 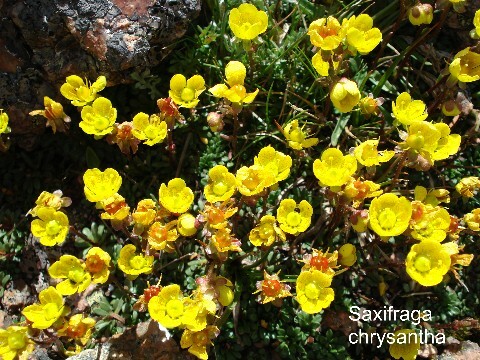 An alpine gem which grows only on exposed mountain crests. 20410.00 Chunky whitish leaves bear large yellow flowers. 15580.09 Ex Craddock. Chunky gray tufts bear huge flowers of golden-yellow aging to orange. 56976.06 Clusters of violet to deep lilac, 5-petalled, open flowers with yellow centers. Rhodiola integrifolia (Crassulaceae) (15x4,Z3,P,L,1) ................................................... 100 seeds / $3.50 60878.35 (W) Park Co., CO, 12500ft, 3811m. The "King's Crown" of the Rockies. Forms multi-stemmed stands, each fleshy stem topped with flattened deep rose-red heads. A thrilling show in full bloom. From slightly moist alpine meadows. Rhododendron ferrugineum (Ericaceae) (30x50,Z4,P,L,3:8w) .................................. 200 seeds / $4.00 30424.17 (W) Alpi della Zillertal, Italy, 6560ft, 2000m. "Alpenrose." 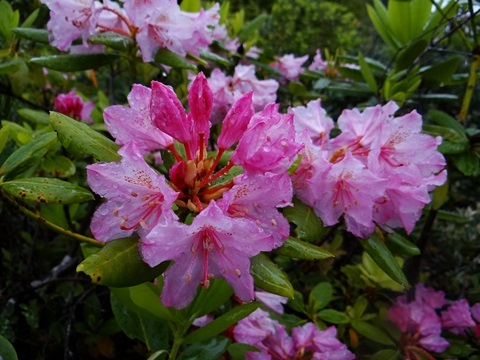 Small shrubs with deep pink flowers opening from rose-red buds. 56562.14 (W) Eddy Co., NM, 4800ft, 1463m. As one might guess from the name, the deep green leaves are divided into small leaflets. Tiny white flowers in spring turn into hairy orange berries. 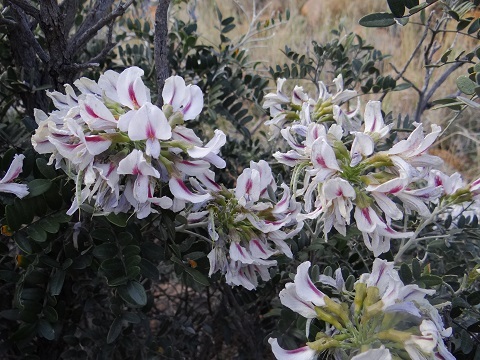 An extremely drought-resistant bush found in large stands throughout the Chihuahuan Desert. Ribes cereum (Grossulariaceae) (120x90,Z4,P,C,3:12w) ............................................... 50 seeds / $3.50 12424.23 (W) Boulder Co., CO, 8750ft, 2668m. One of the few Ribes spp. without spines. 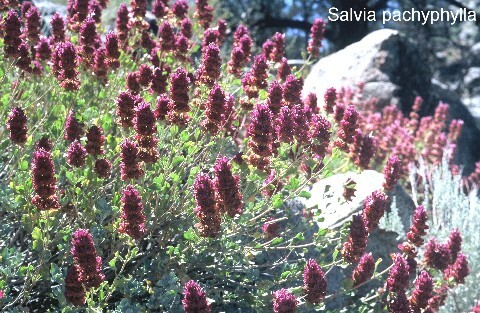 Spicily-aromatic, flabellate foliage with deep pink flowers followed by red berries in the fall. Growing on montane, granite hillsides. 12700.15 (W) Ventura Co., CA, 4000ft, 1220m. "Matilija Poppy." Huge white poppy flowers up to 6". Rosa arkansana (Rosaceae) (30x24,Z4,P,C,4:12w) ....................................................... 50 seeds / $3.50 22452.13 (W) Elbert Co., CO, 6600ft, 2012m. Single, fragrant roses of pure white, pink, deep red and all shades in between, including bicolor combinations. Bright red hips in the fall. Rosa stellata ssp. mirifica (Rosaceae) (100x40,Z5,P,C,4:12w) .................................... 40 seeds / $3.50 76797.35 (W) Otero Co., NM, 7400ft, 2256m. "Sacramento Rose." 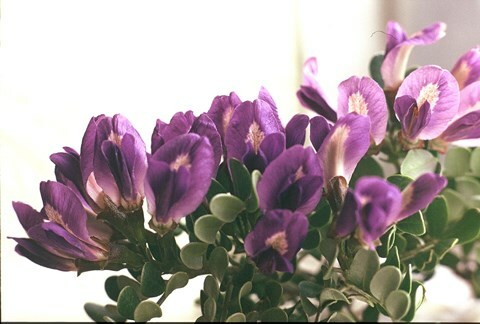 Single rosy-purple flowers. 36006.09 "Wild Petunia." Delicate flowers of bluish-lavender, crinkled like a miniature Petunia. 07056.15 Ventura Co., CA, 4900ft, 1494m. 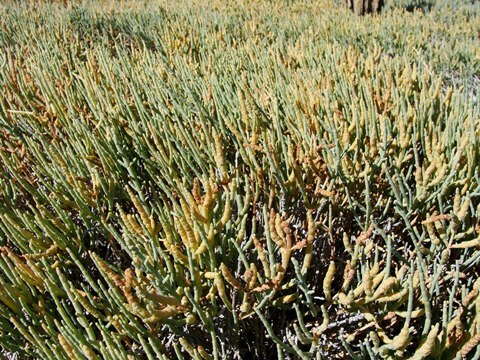 Imposing plants with lanceolate leaves appear ashy-gray due to dense, minute hairs. 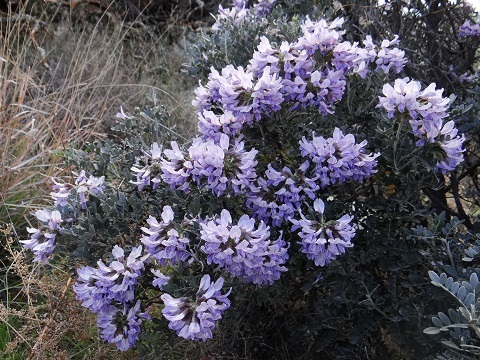 Multiple spikes with whorls of white/lavender flowers appear in summer. 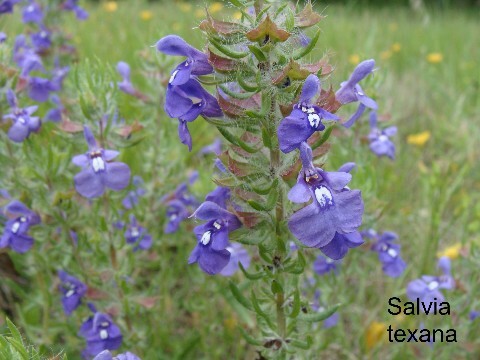 Salvia azurea (Lamiaceae) (70x90,Z5,P,C,1) ................................................................... 40 seeds / $3.50 09903.06 Plants can reach nearly 5 feet tall under ideal conditions but in Texas I have seen them peak out at 2 to 3 feet on the dry soils of the Edwards Plateau. Myriad spikes of azure blue flowers from mid-summer to fall, especially if spent spikes are cut. 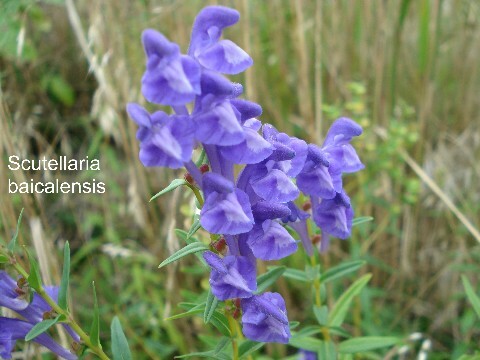 Tolerates drought and is a good butterfly attractor. 15835.28 (W) Yakima Co., WA, 2100ft, 640m. 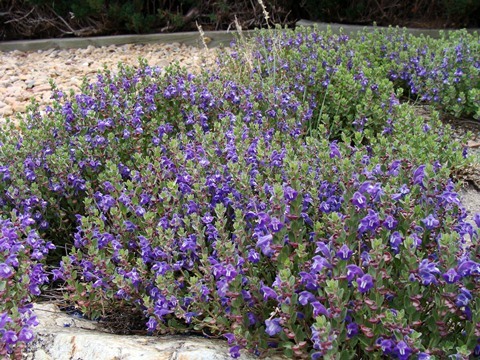 Medium-sized shrubs with small, crinkled, silvery-gray leaves and long spikes of blue flowers surrounded by large purple bracts. On basalt slopes. Salvia eremostachya (Lamiaceae) (65x75,Z7,P,L,2) .................................................... 80 seeds / $4.00 27441.61 (W) Riverside Co., CA, 3600ft, 1100m. Rounded shrubs with narrow, resinous, rugose foliage. Lilac flowers surrounded by rosy-purplish bracts in small heads. 51034.06 Vigorous plants with ferny and hirsute foliage bear many deep blue spikes of "upside-down" flowers. Salvia kopetdaghensis (Lamiaceae) (90x40,Z5,P,L,3:8w) .............................................. 40 seeds / $3.50 52830.04 I have little information on this species but photos from the web indicate numerous spikes of blue-purple flowers. Cult. seed from Austria. 56795.20 (W) San Bernadino Co., CA, 4200ft, 1280m. Multiple stems terminated with heads packed with sky blue flowers, the anthers greatly exserted, all surrounded by large creamy bracts. 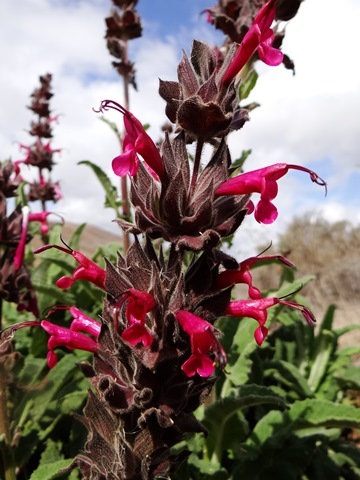 Salvia sonomensis (16x60,Z5,P,L,3:6w) ................................................................... 100 seeds / $3.50 76818.11 (W) Siskiyou Co., CA, 4200ft, 1280m. Mats of grayish-green, elliptical leaves, woolly underneath and puckered above, often spreading to several feet wide with age. Interrupted whorls along the numerous scapes bear blue-purple flowers with a prominent lower lip. Superb drought resistance. Sanguinaria canadensis (Papaveraceae) (16x10,Z3,P,C,4:12w) ........................................ 40 seeds / $3.50 12222.06 "Bloodroot." Beautiful white flowers emerge early in the spring as its single, palmate gray-green leaf unfurls. Slowly spreads to form colonies on the forest floor. Difficult from seed, requires oscillating temperatures or "outdoor" treatment for best germination. Seed refrigerated, sow immediately upon receipt. 12048.06 Dense and tight succulent tufts with showy heads of rosy-pink flowers. 71015.18 Ex Bolgar Dag, Turkey, 3000m. Almost as compact as Silene acaulis forming broad mounds of bright green bearing rich pink flowers on prostrate stems. Saponaria X sündermannii (Carophyllaceae) (8x25,Z4,P,L,3:8w) ................................. 40 seeds / $3.50 94963.01 A hybrid between S. bellidifolia and S. caespitosa which retains the compact habit of the former and heads of rose flowers of the latter. 90418.05 "Voodoo Lily." Mature bulbs produce one huge leaf divided into about 10 segments and one huge, stinky flower, the purplish-spotted spathe up to 2 feet long with a spadix over a foot long. Saussurea weberi (Asteraceae) (12x9,Z3,P,L,3:6w) ....................................................... 50 seeds / $4.00 92370.14 (W) Park Co., CO, 12600ft, 3841m. Heads of deep purple with protruding stamens and styles transform into beautiful white, plumose seedheads. Saxifraga aizoides (Saxifragaceae) (7x40,Z5,P,L,3:8w) ................................................. 100 seeds / $3.50 05002.13 (W) Tyrol, Obernberg, 1800m., Austria. Forms extensive mats of small rosettes of linear leaves which are covered with myriad scapes of yellow, orange-dotted flowers. Saxifraga bryoides (6x10,Z4,P,L,3:8w) .......................................................................... 100 seeds / $3.50 10768.13 (W) Tyrol, Mt. Patscherkofel, 2200m., Austria. Mossy, flat cushions with creamy-white flowers on short scapes. Resents lime. Saxifraga mertensiana (12x10,Z5,P,L,3:10w) .............................................................. 100 seeds / $4.00 56435.12 (W) Whatcom Co., WA, 5100ft, 1555m. The leaves might be the most attractive feature -- ruffled, pleated and toothed foliage with short sprays of tiny pale pink flowers. On NW-facing, wet volcanic rocks. Saxifraga oppositifolia (Saxifragaceae) (2x40,Z3,P,L,4:8w) ............................................ 100 seeds / $4.00 83070.17 (W) Park Co., WY, 10450ft, 3186m. Dense rubbery cushions display sessile, deep rose-purple blossoms. On steep, N-facing cliffs of igneous origin. 70222.06 Spreading cushions of gray-green leaves. Densely-branched inflorescences of white flowers. Saxifraga scardica (8x16,Z5,P,L,3:8w) ........................................................................ 100 seeds / $4.00 76138.13 (W) Korab Mtns, 1400m., Albania. Hard domes of spiny rosettes bear thick scapes of large white flowers, often aging to deep pink. A decorative but challenging plant. Saxifraga tolmiei (6x20,Z4,P,L,3:10w) .......................................................................... 100 seeds / $4.00 78814.12 (W) Whatcom Co., WA, 5000ft, 1524m. Mats of tiny, succulent, shiny, bright green leaves bear numerous 1"-2" scapes of starry white flowers. On volcanic alpine slopes. 78760.06 (W) Ex Anchorage, AK, 100ft. Forms broad mats of stiff, prickly rosettes. Clouds of white flowers on short scapes, the petals intricately patterned with tiny burgundy and chestnut spots. 70235.37 (W) Montezuma Co., CO, 5600ft, 1707m. Very robust population, some barrels were over a foot tall. Purple to lavender flowers. 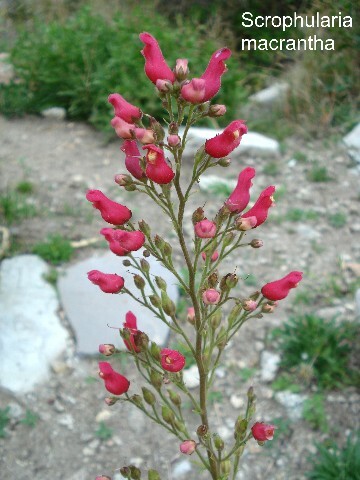 56172.08 This great New Mexican native displays long wands of puckered scarlet blossoms nearly all summer. 05481.07 Bicolored flowers of cream and light indigo festoon this classic European alpine. Sedum debile (Crassulaceae) (10x12,Z5,P,L,3:6w) ................................................... 100 seeds / $3.50 15370.18 (W) Lander Co., NV, 8600ft, 2622m. Clusters of small, grayish-green to pale green, roundish leaves. The yellowish flowers are most attractive in masses. Sedum divergens (Crassulaceae) (5x8,Z5,P,L,3:8w) ................................................... 100 seeds / $4.00 15650.13 (W) Linn Co., OR, 5600ft, 1707m. 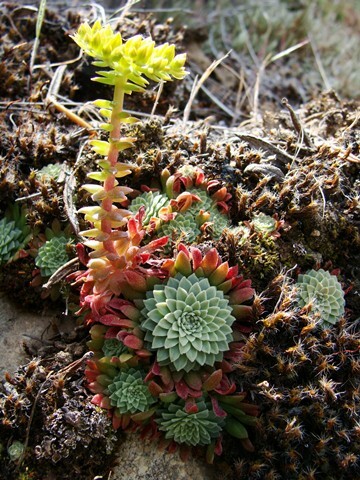 Lining the short, decumbent stems are leaves like small, flattened spheres and colored green with dark red highlights. Flat-topped heads of yellow, starry flowers. On S-facing volcanic ledges and screes. Sedum divergens (Crassulaceae) (5x8,Z5,P,L,3:8w) .................................................. 100 seeds / $4.00 15650.24 (W) Jefferson Co., WA, 5000ft, 1524m. Lining the short, decumbent stems are leaves like small, flattened spheres and colored green with dark red highlights. Flat-topped heads of yellow, starry flowers. On S-facing volcanic ledges and screes. This population from the dry (west) side of the Olympic Peninsula. 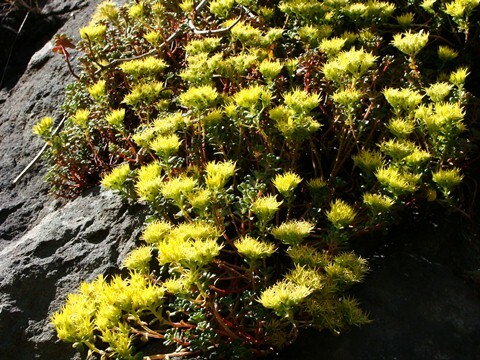 Sedum kamtschaticum (Crassulaceae) (14x100,Z5,P,L,3:8w) .......................................... 100 seeds / $3.00 52216.01 A great ground cover of evergreen, toothed, succulent foliage covered with yellow star-like flowers in spring and summer. 54218.18 (W) Park Co., WY, 7500ft, 2286m. 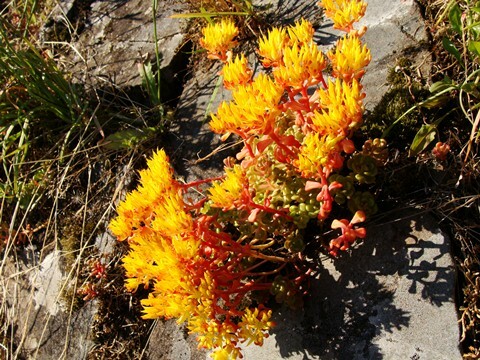 The ubiquitous Sedum throughout the Rocky Mountains with bright yellow flowers and tightly-packed, lanceolate leaves. Especially robust form here. Sedum lanceolatum (Crassulaceae) (10x8,Z4,P,L,3:8w) ............................................ 100 seeds / $3.50 54218.23 (W) Lewis and Clark Co., MT, 6350ft, 1936m. Extra robust form here with large clusters of bright yellow flowers over chunky stems. Sedum niveum (Crassulaceae) (7x22,Z6,P,L,3:8w) ........................................................ 100 seeds / $3.50 58650.15 (W) Riverside Co., CA, 7825ft, 2386m. Short stacks of small, dark-green, triangular leaves carpet N-facing granite ledges. An uncommon species with large white flowers. Sedum oregonense (10x25,Z5,P,L,3:8w) ........................................................................ 100 seeds / $3.50 67440.42 (W) Josephine Co., OR, 5425ft, 1654m. Mats of thick, glaucous blue leaves, similar to S. obtusatum. Creamy-yellow urceolate flowers in compact panicles. On a N-facing serpentine outcrop. Sedum spathulifolium (Crassulaceae) (6x16,Z6,P,L,3:8w) ........................................... 100 seeds / $3.50 76724.34 (W) Lane Co., OR, 5600ft, 1707m. 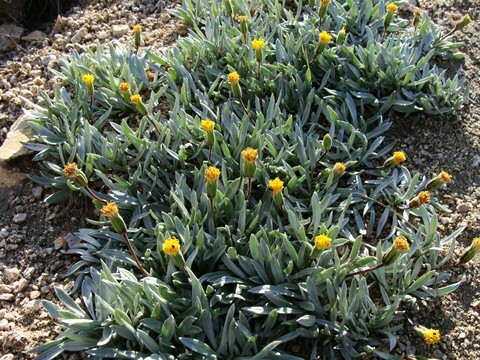 Glaucous bluish-white rosettes with starry yellow flowers. On E-facing volcanic ledges. Senecio incanus (Asteraceae) (10x20,Z4,P,L,3:8w) ........................................................ 100 seeds / $3.50 61812.14 (W) Alps. Tufts of silver, deeply-lobed foliage bear myriad heads of yellow to orangish-yellow flowers. This seed is a mix from numerous populations across the European Alps. 23432.25 (W) Uintah Co., UT, 5580ft, 1701m. "Silver Buffaloberry." Silver-gray, dioecious shrubs bear orange berries by late summer (female plants). Good bird attractor often used as "living fences." 15414.08 Magenta flowers over mounds of blue-green, velvety-textured foliage. Yunnan. 30418.04 Ex Turkey, Bolgar Dag, 2600m. 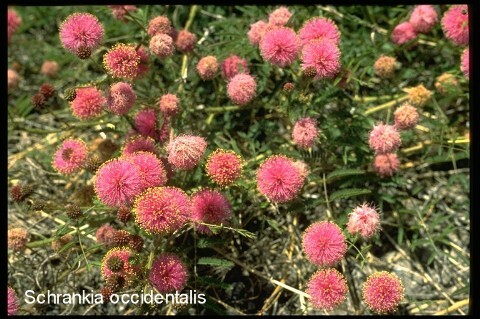 Tufts of hairy, linear leaves with pink-red flowers. Silene jenissensis (Caryophyllaceae) (30x25,Z4,P,L,1) ...................................................... 90 seeds / $3.00 50418.11 (W) Altai, Russia, 7220ft, 2200m. Tufts of narrow leaves bear several stems with white to pink, bifid flowers. 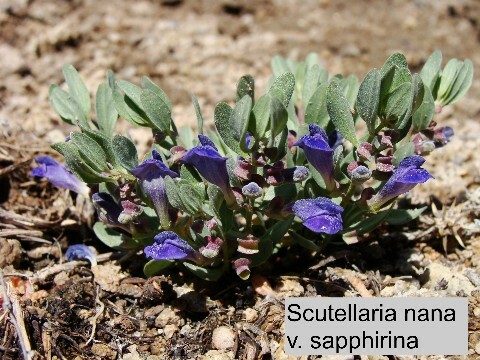 Little-known plant from Russian mountain-steppe belt. Silene plankii (7x16,Z6,P,L,2) ........................................................................................... 50 seeds / $4.00 70556.18 (W) El Paso Co., TX, 6850ft, 2085m. Tufted mats of linear leaves sprout short stems terminated with bright red-orange, laciniate flowers. On E-facing cliffs of rhyolite. Introduced in 1995. Silene regia (90x20,Z5,P,L,3:8w) ........................................................................................ 70 seeds / $3.50 74392.02 Crimson-red flowers adorn sticky stems in mid to late summer. Great hummingbird plant. Silene sendtneri (Caryophyllaceae) (?x?,Z?,P?,L,1) ........................................................ 90 seeds / $3.00 76419.14 (W) Mt. Kom Kucki, 2400m., Montenegro. The only information I have on this one is that the flowers are white with long, twisting styles. Simmondsia chinensis (Buxaceae) (90x100,Z9,SC,1) ...................................................... 15 seeds / $3.50 12377.16 (W) Yuma Co., AZ, 2375ft, 724m. "Jojoba." Dioecious shrubs with olive-green, evergreen, ovoid leaves. Yellow-green, petal-less flowers are followed by nuts from which Jojoba oil is expressed. Soaking the seeds in warm water overnight recommended prior to sowing. 78971.08 Delightfully fragrant, large, white, 3"+, funnelform flowers with flaring lobes over soft-hairy leaves from tubers. Originally from Grigsby Cactus Gardens. 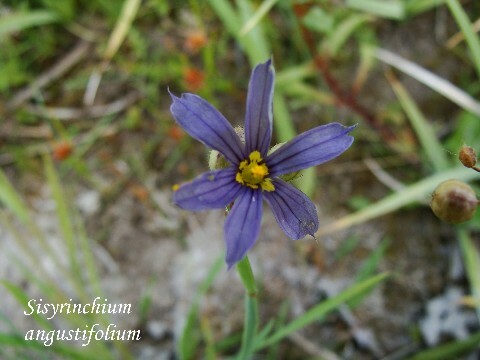 Sisyrinchium bellum (Iridaceae) (16x14,Z6,P,C,3:6w) ............................................... 70 seeds / $3.50 10416.13 (W) Lake Co., CA, 2950ft, 900m. Blue-purple flowers over grassy tufts. Solidago virgaurea ssp. minuta (Asteraceae) (25x15,Z5,P,L,1) ........................................ 80 seeds / $3.50 90635.11 (W) Tyrol, Mt. Patcherkofel, Austria, 6560ft, 2000m. "Alpine Goldenrod." Lanceolate leaves, myriad small yellow daisies from every axil on the upper stems. Sophora secundiflora (Fabaceae) (100x80,Z7,P,SC,1) ..................................................... 25 seeds / $3.50 76372.35 (W) Eddy Co., NM, 4450ft, 1357m. Deep evergreen glossy pinnate leaves. Beautiful dense clusters of violet-blue to lavender flowers followed by silvery chained pods containing large red to orange, round seeds. Sorbus sitchensis (Rosaceae) (180x180,Z4,P,C,3:12w) .............................................. 60 seeds / $3.50 76638.13 (W) Yakima Co., WA, 5475ft, 1669m. Beautiful bushes with pinnate, serrated leaves which bear clusters of white flowers in the spring followed by bright, red-orange berries.